A tiny hill station which is located in the Thane district of Maharashtra, Jawhar is a place which is a fine example of nature's beauty along with many manmade attractions as well. The hill station has numerous picturesque viewpoints which make it a well-known destination amongst many. Nestled in the beautiful Sahyadri ranges and at a distance of about 165 km from Mumbai, the place is fondly called the Mahabaleshwar of Thane. With a pleasant climate and beautiful scenic beauty, the place is beyond words to describe. It holds a strong cultural connection and historic evidences which take you back to the 14th century. The place is home to the tribes of Warli, Kolcha and Kukana who have taken efforts to preserve their culture and traditions. Jawhar is well known for the Warli paintings which depict scenes from everyday life of the Warli tribes. Jawhar is a place which is welcoming throughout the year as the climate remains pleasant throughout the year, making it an excellent place to stay. By Air: The nearest airport is at Nasik which is at a distance of 80 km. The airport has flights operating to various destinations across the country. Mumbai airport, which is around 165 km from here is an international airport and offers good connectivity to major cities across the globe and also across the country. By Train: Igatpuri is the nearest major railway station which is located at a distance of 60 km from here. The station is well connected across various towns and cities within the state as well as to other places across the country. By Road: One of the best ways to reach Jawhar is by road. There are plenty of buses which operate from Mumbai, Thane, Nagpur and other cities across the state of Maharashtra. One of the most popular sights here is the cascading waterfalls of Dabdaba. This is a beautiful place which is tucked in the dense cover of lush greenery and thick forests and also offers plenty of modern facilities to its visitors. The sight of the waterfall will surely boast your spirit and sweep your feet away. Hanuman point is a view point with a mythical backing to it. According to the myth, Hanuman is said to have taken rest at this place while he was on his way to meet Bharath, Rama's brother. Going by the myth the place was named Hanuman Point. 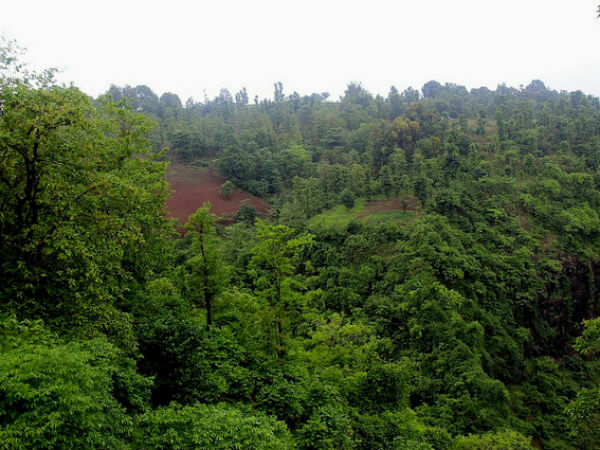 The point offers a breathtaking view of the valley and the sprawling greenery. Also known as Raj Bari, the palace was the residence of the kings of the Munke family. The location of the fort enabled the kings to keep an eye on the enemies. The palace is an example of fine architecture which features an attractive dome and is surrounded by the green surroundings. A look at the interiors of the palace would give you a peek into the lifestyle and culture of the Munke tribal kings. Built by Chhatrapati Shivaji, the fort is a relatively smaller structure and is almost synonymous with the Maratha Kingdom. The fort has dark inner chambers and is said to be carved out of a dilapidated rock. According to legends Shivaji used this fort to conduct his personal and a few official meetings. It is also believed that Rama along with his wife Sita and their sons Lava and Kusha had visited the fort. One can notice four footprints at the fort which are believed to belong to Rama and his family.